Permanent pastures often mix a grass and legume to improve nutrition, utilization, and yield. Grasses are generally easier to grow than legumes because legumes have more narrow parameters like adaptation range and pH. Obviously, fertilizing for a single species would be much more simple. But legumes are generally higher in protein and mineral content, increasing the feed value. 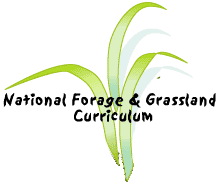 When a pasture is made up of grass, nitrogen is often the cause of limited growth. Having a legume to fix nitrogen and make it available in the soil for the grass is advantageous. If a pasture is more than 50% legumes, then N fertilization does not provide significant gains. Pastures containing more than 50% grass would benefit from N applications. But fertilization is a complex issue, as has been discussed, because the different nutrients have various relationships with each other. In order to make the best use of nitrogen the P, K, pH, must be kept in balance. The general rule is to fertilize for the legume. Grasses are more tolerant of soil acidity than alfalfa and some other legumes. Liming should be considered for the legume requirements.